Technology makes so many dental procedures quicker and less painful than ever before, but a tooth extraction still causes fear and trembling for many who need the procedure. This is due in part to the fact that a tooth extraction is generally more involved than many other dental procedures and because of that, can cause a lot of anxiety. But while a tooth extraction is a surgical procedure and often requires a few days of recovery time, an experienced dentist will be able to reduce pain and discomfort and help you on your way to a healthy, pain-free mouth. Your dentist generally looks to resolve the problem of a damaged tooth with a filling or crown. But in some cases, those common procedures just aren’t enough, and the only option is to extract the tooth, removing it from the bone. Causes for extraction can include trauma or injury, decay or infection. In some cases a tooth has to be extracted to prepare for orthodontia or for other reasons related to spacing or crowding. In some cases, a dentist needs to remove baby teeth that don’t fall out to make room for permanent teeth. And many of us have had wisdom teeth (or third molars) removed. These teeth, which come in in the teens or early 20s, are generally removed if they cause pain or become impacted. Before surgery, your dentist will take x-rays to determine the condition and shape of the tooth, gums and bone. A full medical and drug history will also be taken to assess any risk factors. Based on the extent of damage and other factors, your dentist will decide which type of extraction you need. There are two types of tooth extractions: simple and surgical. A simple extraction is generally performed by your dentist and involves removing a tooth whose root structure makes its removal relatively routine. A simple extraction involves loosening the ligaments around the tooth through movement and removal of the tooth using forceps. 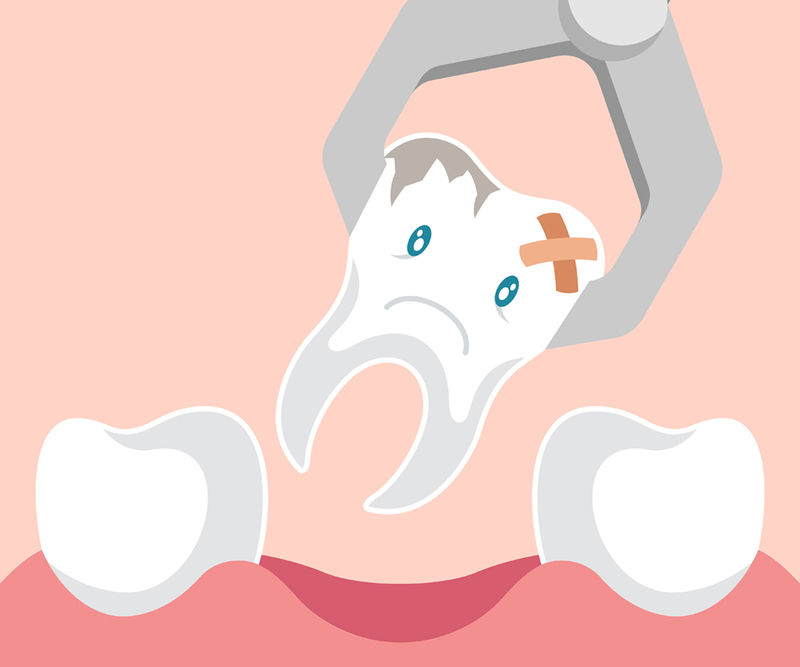 A surgical extraction is often required for impacted or badly broken teeth. This procedure is often done by oral surgeons, but can also be done by experienced general dentists. In this case, the dentist must cut into the patient’s gum to remove the tooth and in some cases she must also remove some of the bone around the tooth. In cases of extensive damage, a tooth may have to be removed in multiple pieces. This type of procedure generally means more time in the chair and also a longer recovery time. Depending on the number of teeth being removed and whether the tooth is impacted, along with a number of factors related to the patient, your dentist will use a local or general anesthetic during a tooth extraction. For most patients, a local anesthetic is usually sufficient, but in some cases, the extraction is safer and more successful if the patient is put under general anesthesia. During a tooth extraction, you should expect to feel pressure, but you shouldn’t experience pain. If you feel pain during the procedure, let your dentist known and anesthesia will be adjusted. Recovery from a tooth extraction can take several days. In some cases, your dentist will prescribe antibiotics after the extraction, particularly in patients with medical conditions that make them susceptible to infection. Patients should also expect bleeding after a tooth extraction. Your dentist will apply gauze to the affected area to help with the clotting process, and in some cases a few stitches may be needed. The area should clot within 24 hours, and patients should be careful not to disturb the clot, which forms a protective barrier. After 24 hours, patients can rise with salt water to keep the area clean. Many patients experience some discomfort after the procedure. Plan on taking it easy for several days following the extraction. Your dentist may prescribe pain medication in the case of more complex surgeries or may recommend ibuprofen or another over the counter pain reliever. Your dentist will let you know about options for replacing the tooth, including dental implants, which allow you to replace the missing tooth or teeth with a replacement tooth or bridge, allowing the replacement tooth to bond to the jawbone. Let’s face it: a tooth extraction will never be something to look forward to. But with Greenhill’s experienced dentists, the procedure is absolutely routine and safe. We’ll talk openly about any underlying conditions and let us know if you have any unresolved concerns. This will help take to worry factor out of the equation. You’ll know you’re in good hands and on your way to a healthy mouth.